Resonates with Martyn's legendary analogue synth know-how and it's easy to make his sounds your own. Fabulous sound design captured through different recording chains. Simple but effective parameter set for further sonic manipulation. Easy to make the core patches your own. A founder member of both The Human League and Heaven 17, Martyn Ware's production credits include records for Tina Turner, Terence Trent D'Arby and Erasure. Now he has produced a Kontakt Library for Spitfire Audio's Signature Range, Martyn Ware - No Illegal Connections. It contains over 270 Kontakt patches constructed from samples taken from Martyn's Roland System 100 and Jupiter-8 synths, alongside drums and special effects from his Korg 700. "Martyn hasn't simply filled this library with 'expected' programs alone - it resonates with his experience and command of the legendary source hardware"
You'll need a full version of Kontakt 4 or 5 to run the library; thereafter, life is simple. 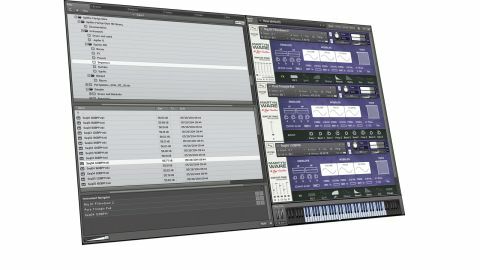 Spitfire have constructed a custom Mercury Synth shell into which Kontakt patches are loaded, similar to that designed for Spitfire's Enigma with Leo Abrahams. Most patches offer Mic, Amp, Chorus and Spring Reverb streams alongside the regular DI source, which can all be balanced via faders. To the right, the editable parameters offered are basic but effective. Along the bottom row, you'll find eight insert effect engines covering three-band EQ, Lo-Fi, LowPass Filter, Chorus, Reverb, Delay, Distortion and Phaser. As many of these can be activated as you like and right-clicking (or Command-clicking on a Mac) shows effects parameters for tweaking. The synth engine above starts by providing low and high-pass filters, to which MIDI controllers can be assigned. Below this, a single ADSR envelope covers volume shaping whilst there are three 'wobble' sections where LFOs can be independently attached to Volume, Pitch and Filter, with Frequency (speed) and Amount options. Lastly, a Yoke lets you assign MIDI controllers to an X/Y pad for further real-time manipulation. Martyn hasn't simply filled this library with 'expected' programs alone. Instead, it resonates with his experience and command of the legendary source hardware. There's lots of sci-fi here, alongside patches too rich and atonal to hold down more than one note at a time. Of course, there are sequences, pads, leads and basses aplenty too but these become your own when you start combining the DI signal with other audio streams, with the Amp, in particular, adding a pleasingly rich grit. Additionally, the Warped folder offers patches enhanced with treatments through gear such as the Culture Vulture to provide a richer sonic character still. There are lots of soft synths for around the price of this library which offer a greater array of parameters. But if you want Martyn Ware as a sonic collaborator, before taking his patches on to wherever you need them to get to, this library is a treasure trove.